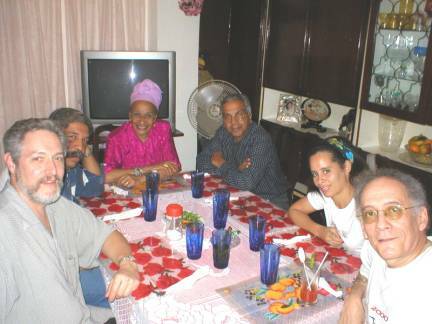 I was privileged to be the lunch guest of the great timbale maestro Amadito Valdés on February 18, 2003 at the excellent paladar Los Amigos near Hotel Nacional in Havana. The affair was arranged by my friend, translator and Amadito's Godson Julio César García. We were joined by another great Salsera, the beautiful Teresita Garcia Caturla who is also Julio's aunt. Our party also included Amadito's daughter, Julia Esther Valdés, and 2 other friends. The paladar is frequented by prominent Cuban musicians. We waited for our table while another party, including Lázaro Valdés of the Timba group Bamboleo, finished their meal. On another day, the same table was occupied by Pedro "Pedrito" Calvo, formerly of Los Van Van, and his family. The musical careers of both Amadito and Teresita span 40 years. The Cuban Revolution of 1959 and ensuing economic embargo conspired to isolate Cuban popular music for 30 of those years. In the mid '90s, Juan de Marcos González' multi-generational all-star project brought Amadito and others together for the production that became the Buena Vista Social Club phenomenon, a revival of the great Cuban music of the 20th Century in contemporary form. Amadito and Teresita are riding this popular new wave of interest in the classic popular music of Cuba. Each has produced a CD combining great Cuban talent from the older and younger generations now practicing this art in Havana. Amadito's CD is titled "Bajando Gervasio" and is available now at Descarga.com. Teresita's CD is titled "Llegó Teté" and should be released by the end of March. I have heard both productions and I highly recommend them. After a casual meal of excellent comida Criolla Cubana with these delightful people, I had the chance to interview Amadito and Teresita for about 30 minutes. We spoke about the new CDs, their musical careers, and other topics. On behalf of fans of Timba for example, I asked Amadito what he thinks of this new style of Cuban music. "Interesting" was his answer, "explosive". He is impressed with Timba's eclectic mix but can listen to it for only about half an hour at a time. Here is a transcript of the interview. TA: Let's start by introducing everyone here at the table. AV: Teresita Garcia Caturla, Manuel "Manolito" García of the Ministry of Tourism, Orlando Matos journalist and producer of a cultural radio program in Havana (Gaceta Cultural de Radio Habana Cuba), my godson Julio César García, and my oldest daughter Julia Esther Valdés. TA: Tell us about your new CD. TG: The CD has not been released yet. It's is my first CD, even though I have made a lot of records with my first group the D'Aidas Quartet. These were produced in 1979. Then Afro Cuban All Stars in 1997 and 1998. TA: What will be the title of the CD? TG: "Llegó Teté", "She Survived". TA: Was the CD produced here in Cuba? TG: Yes, BIZ Music produced it. TA: When do you expect it to be released? TG: At the end of February or March. TA: Who is on the CD? T: There are many stars. 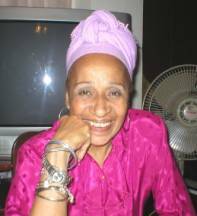 Maestro Amadito Valdés, Ibrahim Ferrer, Pio Leyva, Omara Portuondo. The CD is a small review of all of my artistic life, throughout all my life as a singer. I also made a small homage to D'Aidas Quartet. With Omara, Xiomara Valdez, and a new young, great singer, Amadito's daughter Idania Valdez. She is singing now with Ibrahim on tour in the States. Fabian Garcia Caturia, Omara Portuondo's bass player. 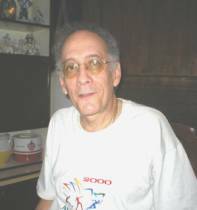 Guillermo Rubalcaba, the father of Gonzalo Rubalcaba. On percussion are Amadito, Adel González, and there is also a theme with Batá. My son plays here, and then there is a new version to one of my father's most famous themes, "Drume Negrita". (Teresita's father was Alejandro García Caturla.) My niece Sorimé Vega plays flute on this theme. Everything was produced by Herman Velasco and Gloria Ochoa.